Because of her unique background in both publishing and Web design, in 2009 Susan Daffron was named President of the Small Publishers Artists and Writers Network (SPAWN), which is a non-profit organization that provides information, resources and opportunities for people involved in or interested in publishing. 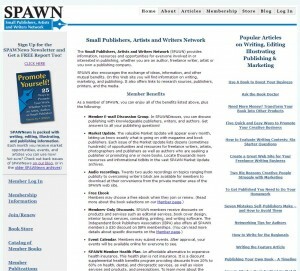 In the summer of 2009, Susan planned, designed, and engineered a major SPAWN Web site overhaul, ecommerce, and blog implementation. She also integrated the new tools SPAWN is using to communicate with and manage members. Susan continues to maintain the SPAWN web site and writes the monthly letter from the president in the SPAWNews newsletter.